I am about my message. My art is my voice, my protest , agreement, whisper, shout, and cry. “To see my artwork is to see me to understand my artwork is to think about the message it conveys. This is my life”..
Leon learned how to do simple and block letters from an early age and has been drawing and creating art ever since. 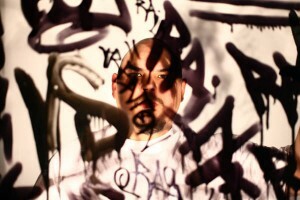 Leon built on this foundation and exaggerated the letters into elaborate forms and styles and drafted a strong connection to hip-hop culture. Annually, Leon curates two art festivals in New Jersey for area painters and the community as well as dedicating his civic duty to teaching several workshops for the Trenton After-School Program. Leon continues to evolve his art by taking lettering into dimensional media, as well as fashion. His knowledge of Graffiti Art History remixed with new materials and styles alter the perception of this art form to present a positive message.